Curry leaves rice/ Kari Patta rice / Curry leaves sadam- a flavorful and healthy rice made with curry leaves, which is apt for lunch box. Curry leaves are good for eyes, skin, hair and loaded with essential vitamins but sadly its often ignored by many including my little one. 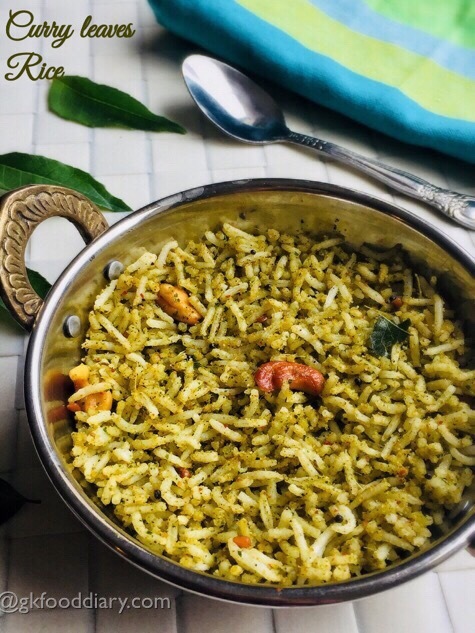 Hence I always look for ways to include this healthy leaves in the form of curry leaves powder or this curry leaves rice recipe. 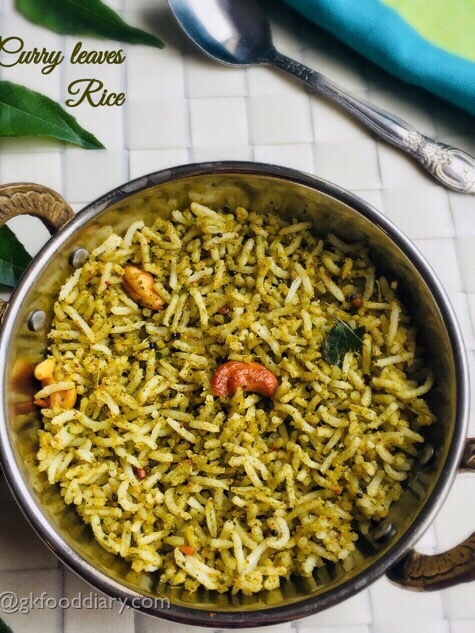 This curry leaves rice is so flavorful and tasty. It be given to kids after one year and once they started eating all family foods! 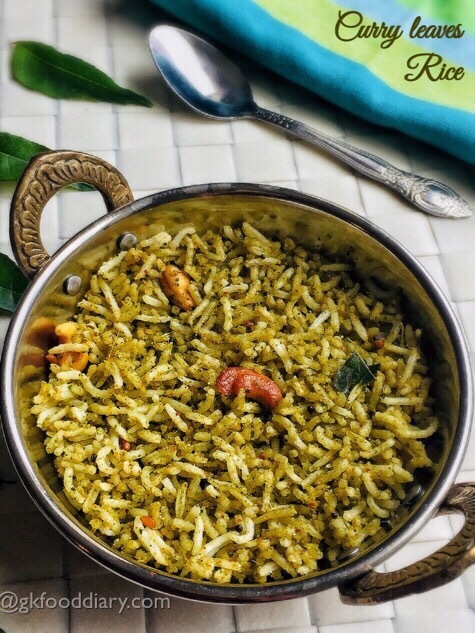 Here is how to make helathy curry leaves rice recipe for toddlers and kids. 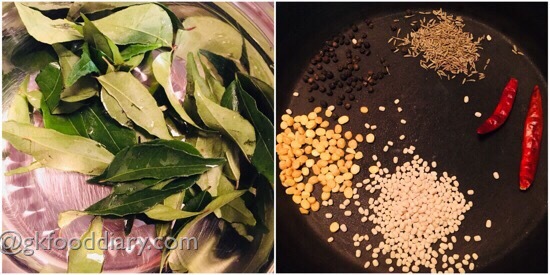 Curry Leaves Rice - A quick flavored meal made with rice, mild spices and curry leaves. Wash the curry leaves in running water and strain the water completely. Then pat dry it with a clean kitchen towel. Set aside. In a pan, add the items listed under to roast & grind. Saute all the ingredients in ½ tsp of oil until golden brown. Then add curry leaves and giev a stir for a minute. Switch off the flame once done and cool it down. Then transfer all the roasted items in a blender/mixie. Grind everything to a slightly coarse powder. Keep it ready. Heat a pan with a tsp of oil. Add mustard seeds and urad dal. Let mustard seeds crackle and urad dal turns brown. Then add the curry leaves and cashews. Roast the cashews until golden brown. Switch off the flame once done. Now add rice to the tempered items and give a mix. 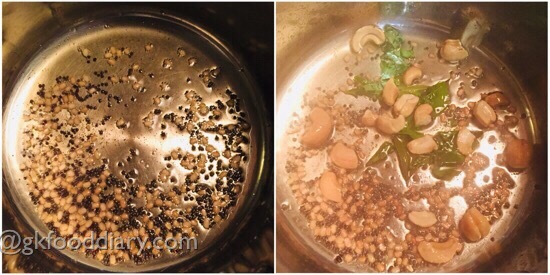 Then add ground coarse curry leaves powder along with required salt and mix with cooked rice using a spoon slowly. 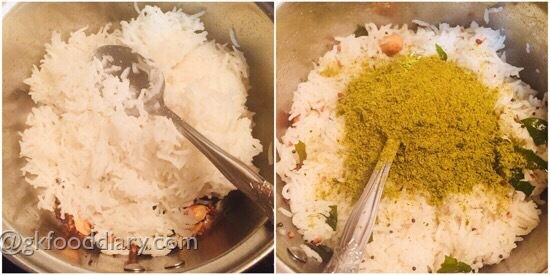 Mix well until the rice is well coated with powdered curry leaves. Finally add a tsp of ghee and give a quick mix. Curry leaves rice is ready. Give at least 15 minutes resting time and serve. 2. Wash the curry leaves in running water and strain the water completely. Then pat dry it with a clean kitchen towel. Set aside. In a pan, add the items listed under to roast & grind. 3. Saute all the ingredients in 1/2 tsp of oil until golden brown. Then add curry leaves and giev a stir for a minute. Switch off the flame once done and cool it down. 4. Then transfer all the roasted items in a blender/mixie. Grind everything to a slightly coarse powder. Keep it ready. 5. Heat a pan with a tsp of oil. Add mustard seeds and urad dal. Let mustard seeds crackle and urad dal turns brown. Then add the curry leaves and cashews. Roast the cashews until golden brown. Switch off the flame once done. 6. Now add rice to the tempered items and give a mix. 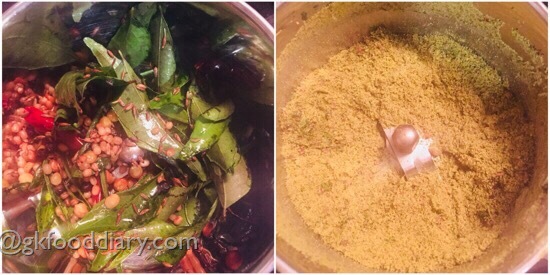 Then add ground coarse curry leaves powder along with required salt and mix with cooked rice using a spoon slowly. 7. 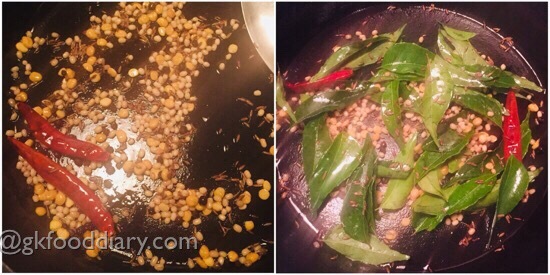 Mix well until the rice is well coated with powdered curry leaves. Finally add a tsp of ghee and give a quick mix. Curry leaves rice is ready. Give at least 15 minutes resting time and serve. 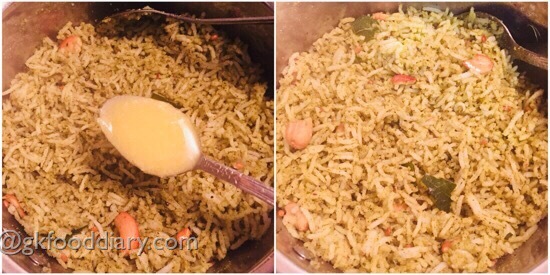 Serve the curry leaves rice with curd and any stir fry of your choice! You can add more red chilies if you want it spicy. 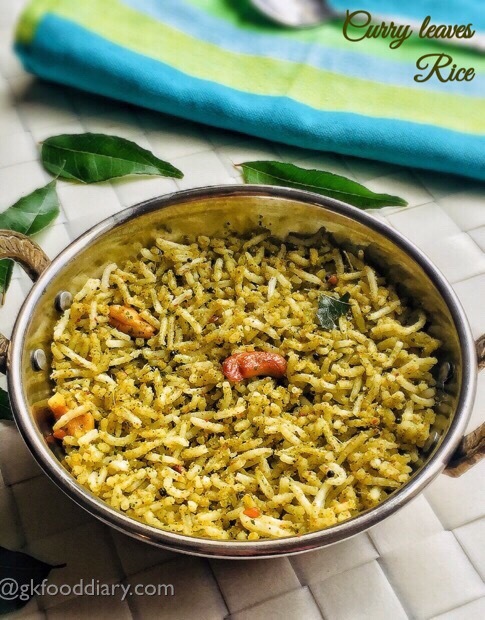 You can even make this curry leaves rice with left over cooked rice too. Make sure to introduce everything separate before you try this curry leaves rice to your baby. 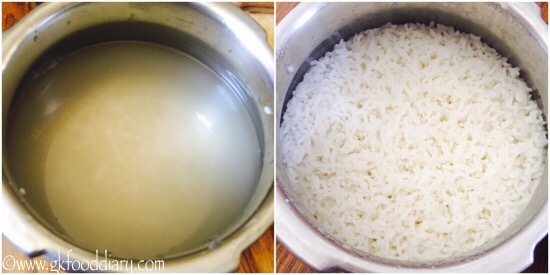 For small babies mash the rice well with curd and offer. Avoid whole nuts for kids below two years. You could use peanuts instead of cashews.